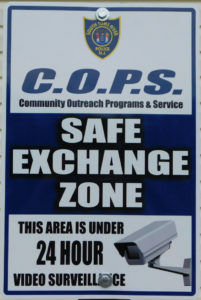 The South Toms River Police Department has created a new service to the residents of South Toms River, “The Safe Exchange Zone”. 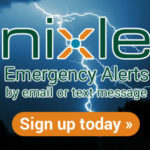 This zone has been set up as a courtesy to and for the protection of South Toms River residents involved in making custodial exchanges involving their children as well as being involved in conducting in-person transactions with service sites such as Craig’s List or eBay. We do not endorse any service and only provide this area as an added layer of safety for our residents involved in online commerce and to help protect our residents from becoming victims of scams, frauds, or thefts. Two parking spaces have been dedicated to this initiative, clearly marked a sign and is under constant 24 hour video surveillance. South Toms River Police Officers will not intervene as witnesses, negotiators, or brokers. 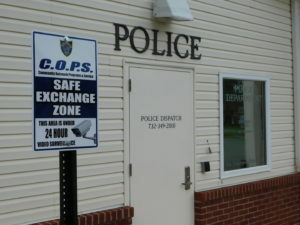 South Toms River Police Officers and civilian staff members are not permitted to provide legal advice or become involved in civil matters resulting from disputes over payment, quality, etc. THE SOUTH TOMS RIVER POLICE DEPARTMENT WILL NOT BE USED TO MAKE ILLEGAL TRANSACTIONS OF NARCOTICS, DANGEROUS OR DEADLY WEAPONS OR ANY OTHER DANGEROUS MATERIALS.